Home > HURTTA Products > Hurtta Y-Harness New - Black, Juniper, Cherry 47"
New updated Hurtta Y-Harness. This new style has a piece along the back that ensure the chest strap sits further back and away from the armpits. This prevents chafing on sensitive dogs and distributes the weight and pressure further back on the dogs shoulders and body and away from the neck area. The neck line on this harness is quite generous and I find it's most suitable for dogs with large neck areas like Bassets, Bulldogs, Labradors, Golden Retrievers etc. Like the old style Y-Harness this one has neoprene padding along the neckline for added comfort and to avoid chafing and rubbing of the skin and coat. Especially suitable for dogs with neck and back injuries to take the pressure of the sensitive neck area. However any dog can wear a harness for walks to prevent neck injures and to make it more comfortable. The Y-Harness does not fix pulling issues, but it protects the dogs sensitive neck and spine from the constant pressure and leash jerking that a pulling dog causes. This harness has been discontinued so limited stock available in some size/color combinations. Sizes 32" and up run big in the neck area so I recommend going down a size if you have a slim necked dog. This is a nice fitting harness and well made, as are all the other products I have tried from this company. It fits large, so I would go one size down. I alternate between this one and the The "Padded Harness" (because I wanted to try both). It doesn't go on as easily as the "Padded Harness", but seems comfortable and gives a fair amount of control (but not quite as much). great harness for an active dog! Q: Hi Katja, I've been waiting on this one but in looking at sizing, I'm a bit mystified. Faith has a 26" girth, and the neckline about 17" (her neck is 13.5"). She has two of the Y-harness older models - a lifeguard and a black where the neck opening is fairly small. What size should I look at? If the size you have is small in the neckline, then I would go with the same size as they are bigger. I believe you have size 28”, correct? The new model is 3” bigger than the old model. Based on your information I would recommend going down a size for each to sizes 28” and 32” as they run big. Q: Wendy, our 10 pound Shoh Tzu, has a 12 inch neck and a 19 inch chest. Would any of the harnesses fit her? Based on your information I would recommend size 18” for Wendy. They run a bit large so even though her chest is 19” size 18” will fit. My German Pinscher has a 21” chest and she takes size 22”. I like the fit of the neckline on size 18” better on her but the chest strap is just an inch too small, so I’m confident that size 18” will be great for Wendy. Q: My niece wants one for her new dachshund her neck is ten inches but her chest is 16 . What size should she get? Thank you very much for your interest in the Hurtta New Y-harness. As they run large I would recommend size 14” for your nieces Dachshund. 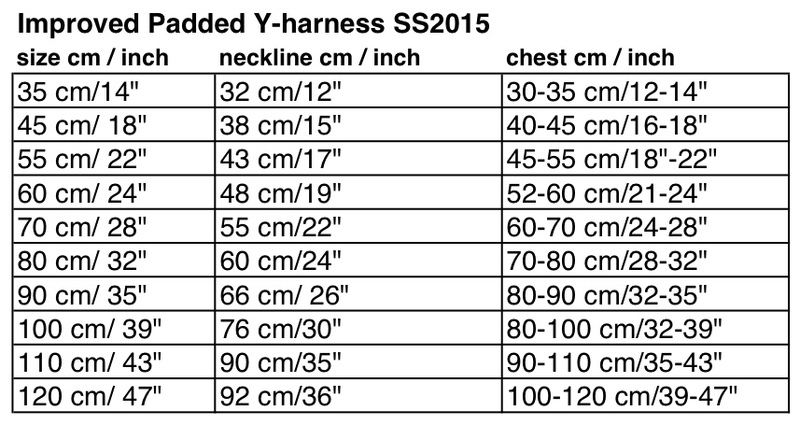 I would recommend the new y-harness in size 32" as they run large. I currently have size 32" in stock in Black and Raspberry. Juniper and Birch should arrive mid September. You are welcome to place an order to reserve one. Q: I would like to order the new Hurtta Y harness. My dog currently wears the size 13 in the Hurtta coats. What size harness would you recommend for him? Thanks. The sizes are based on the dogs chest circumference, so if you are able to measure your dog I would be able to recommend a size for you. You’ll probably need size 14” but it’s best to measure to make sure. Please remember that this harness model runs large so go down a size. So if you dogs measures 16”, you’ll need size 14” etc. Q: I was looking at getting the newest version of the padded y harness for our doxie. He fits in the size 18 of the old version (says hurtta all over it). His girth is 16" and his neck is 11". I read the other questions and it sounds like I might need to go down a size to the 14. The only concern I have is that the strap that goes between the front legs might be shorter and then it would ride up his armpits. What do you think? I find that it's mostly the larger sizes that run very big. The smallest sizes are still roomy in the neck but most dogs need not go down in size. When the girth is 16" I worry that size 14" would be too small in the chest, so I'd recommend size 18" for your Doxie. It'll be 2" bigger in the neck than the old version harness you have. When fitting a harness over the Winter Coat, please be aware that there is a risk of chafing in the armpits as the coat takes up room. I would probably recommend size 24”. If you didn’t need to fit it over the coats I would say size 22”. I wouldn’t go too big as the neckline is plenty roomy on this model and it may get too big. Q: Your sizing video mentioned the new style Padded Y harness has a ring on the bottom that was not going to be continued in newer production. Do the ones you’re shipping now still have the ring? Yes, I belive the harnesses in stock still have the ring. Q: Hi, my dog has a 45cm neckline and a 61cm chest. Which size would you recommend in the harness? Wuuld the size 60 be ok? The size indicates how big the harness adjusts out, so 24”/60cm would be as large as the chest strap gets, so you would need a size bigger, 28”/70cm. The smaller sizes are pretty true to size. It's sizes 32" and up that run big.